Installing your theme is pretty easy! After downloading you should have the hoot-business.zip or hoot-business-premium.zip file depending upon your version. This is your main theme file which contains all of the required templates and images required for the theme to function properly. Premium users: Click here to download your premium theme zip file. Troubleshooting: If you are getting a 'Broken Theme' or 'Stylesheet Missing' error, this simply means that you haven't uploaded the correct zip files. Double check and make sure you upload the exact files as mentioned above. Some servers place a restriction on the file size you can upload via web interface. 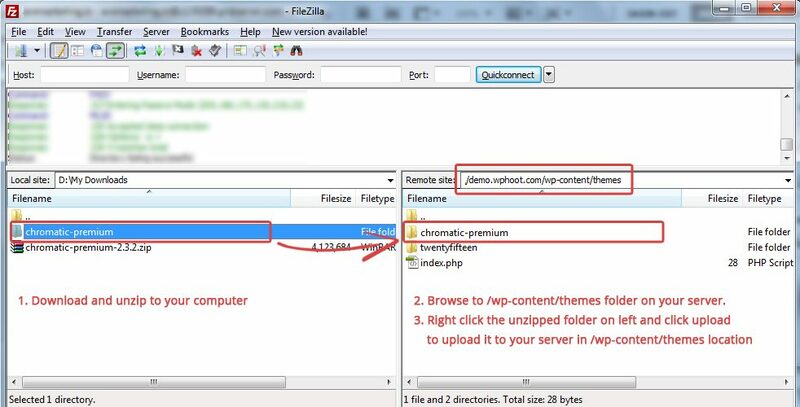 If you are getting an error uploading the theme via WordPress Admin, you can upload it using a FTP program like Filezilla. It's pretty simple really. Unzip hoot-business.zip or hoot-business-premium.zip on your computer. Start FileZilla and login to your server using FTP details provided by your Hosting Company (hostname, FTP Username, FTP Password). HootKit is a wpHoot plugin which adds various functionalities to Hoot Business theme such as widgets, sliders and 1-click demo installation. It is highly recommended to install HootKit plugin to maximize Hoot Business's potential. HootKit sliders and widgets were developed and styled specifically for Hoot Business theme, so they fit Hoot Business perfectly. This keeps your site lightweight and fast without adding any bloated code. Click the Install link below HootKit. Once HootKit is installed, Activate it. In your wp-admin, go to Appearance > Customizer. Click on the Setup & Layout section. Select Boxed or Stretched layout for your site. 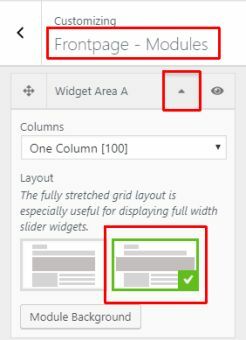 Tip: You can also select Sidebar Layout for various sections of your site here. Set your Site Background and Content Box Backgrounds here. Site background is more prominently visible when Site Layout option is set to Boxed layout in the steps above. Click on the create a new menu link. Now add the pages, categories, custom links you want from the leftside of your screen to this menu. Select the menu you just created in the Header Area (right of logo) and Full width Menu Area (below logo) dropdown. Click on the Header section. In Header Area (right of logo) setting, select the Display Menu option to display the Menu you created in steps above. In Full Width Menu Area (location) setting, select the Top or Bottom option to display the Menu you created in steps above. Hoot Business can display small descriptions below each menu item label. To enter menu item descriptions, make sure Descriptions checkbox is checked in Screen Options dropdown at the top. Premium version comes with the ability to add menu icons. In the Appearance > Menu screen, simply select the icon from dropdown in each menu item. Add Widgets to Topbar Left and Topbar Right Widget Areas. Once you Save Widgets, Topbar will be displayed automatically on the website. Topbar will be automatically hidden if both Left and Right areas are empty. If only one of these areas has content, then the Topbar content will be centrally aligned. Hoot Business comes with various header and logo options. You can select any of these options to create multiple combinations of unique looking headers. Select any of the available options for Header Area (right of logo). You can also select menu display options here. Next, go back and click the Logo section. Select from the available type of logos. Premium Version Next, go back and click the Background section. Hoot Business theme comes with a Frontpage which is made up of several widget areas and sliders. You can easily arrange them in any order, and apply backgrounds/parallax effects to them. Please install the HootKit plugin to activate various widgets that come with Hoot Business theme. We will use the demo homepage as an example for this tutorial. Take a look at the image below to understand how the frontpage layout has been set up. Click on the image below to open a bigger view. In the Frontpage - Modules section, you will find the options to manage the layout. You can also add Module Backgrounds and apply Parallax effect to the background image. Click the dropdown icon next to each module for more options. Go to Frontpage Modules section. Set it to 'full-width' layout. In your wp-admin, go to Appearance > Widgets. Add Hootkit > Slider Images widget to Widget Area A. If you do not see the HootKit > Slider Images widget, then please install the HootKit plugin first. Note that the only the Active widget areas will be displayed. You can activate/deactivate a widget area by clicking the 'eye' icon as shown in the section above. 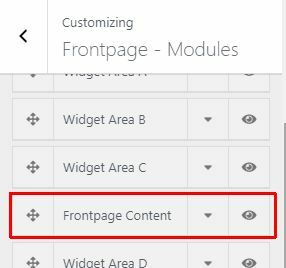 The Frontpage Content module will either display your Blog or the Static Page Content based on your selection in wp-admin > Settings > Reading . For more details, see the next section. By default, the Frontpage Content module (discussed in previous section above) displays your Blog. However, on the the demo site we have set separate Home and Blog pages as described below. Hence the Frontpage Content shows the "static page content" instead of Blog Posts. In your wp-admin area, click Pages > Add New to create a new page. You can enter page content as well. This will be displayed as the FrontPage Content module (see Frontpage Content Module above). In your wp-admin area, go to Settings > Reading. Select the Static Page option. Select the page you just created in Step 2 above in the Front Page drop-down. We have already selected the Static Page option in "Setup Separate Homepage" section above. Select the page you just created in Step 2 above in the Posts Page drop-down. You may want to add links to these pages (Home and Blog) to your menu. Add pages you created in above 2 sections to your menu. These would be your Home and Blog pages. 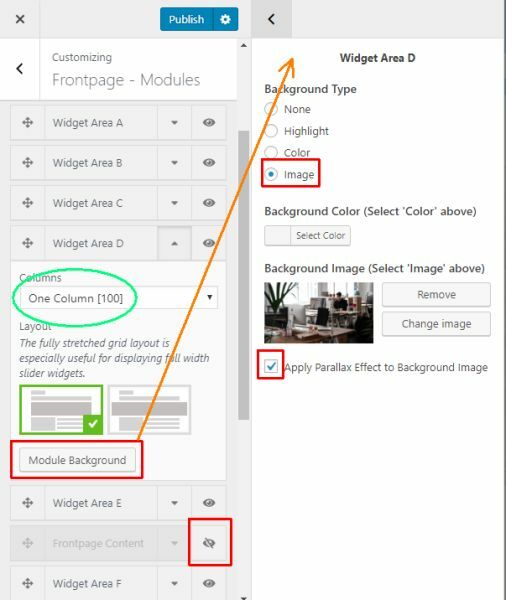 In your wp-admin, click Appearance > Customizer. Select the layout you want under the Archive (Blog) Layout option. Premium Version Premium version offers additional archive layout styles. This layout will be used throughout your site including the blog page, category page, tag page, and any other archive list page. In your wp-admin area, click Posts > Categories. Click the Category name to edit the category. Enter the description in the Description textbox. For entering Blog descripion, please refer to the Setup Blog Page section above. Installing demo content is the easiest way to setup your theme and make it look exactly like the Demo Site. It will allow you to quickly edit everything instead of creating content from scratch. To install demo content, please follow the steps listed in Installing Premium Demo Content section. Free version does not support certain features and widgets available in premium themes. Hence these features/widgets will not get imported when you use the premium demo files to import content. Upgrading from Free to Premium version is pretty straight forward. 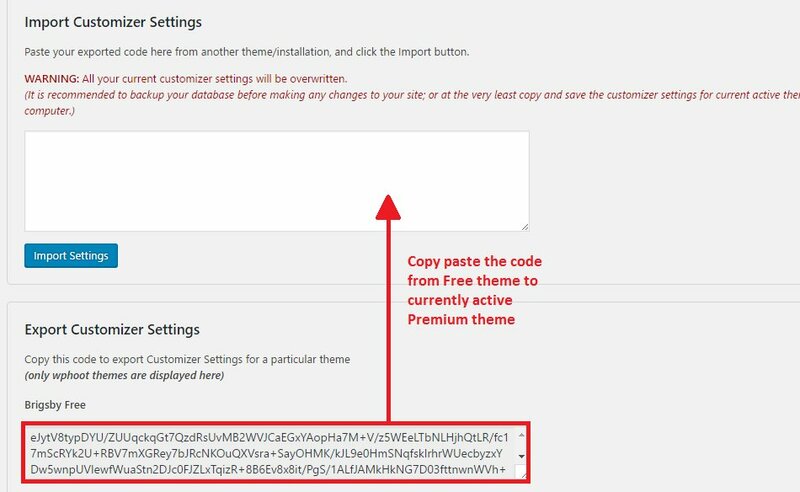 Simply install the Premium theme like described above, and activate it. Technically speaking, the Free and Premium versions are 2 separate themes. This is why the Customizer settings are stored separately by WordPress for Free and Premium versions. You can always use the Hoot Theme Manager to import/export your customizer settings between different wpHoot Themes. This means when you install Premium version, you can import the Customizer Settings from the Free version. Goto Appearance > Hoot Theme Manager. Copy the code from Free version into the textbox and click Import button. Menus are retained, but they may lose their location on switching themes (free to premium). In case you dont see your menu, you may need to reassign its location. Reassign your menu to the their Theme location. Widgets are automatically transferred when you upgrade from free to premium. In small number of cases, widgets may not transfer properly. 1. In your Appearance > Widgets screen, you will see the widgets from Free theme in the Inactive Widgets area towards the bottom left of the screen. Simply drag and drop them back into the proper Widget Areas. Activate the free theme version. Once free theme is activated, install the Widget Importer Exporter plugin. Activate the Premium theme, and go back to Tools > Widget Import Export. Upload the .wie file you created in above step, and click the Import Widgets button. Download the latest version (.zip format) from the Downloads page on wphoot.com (click the download icon on top right when you are logged in). Upload it to your site using the instructions provided above. 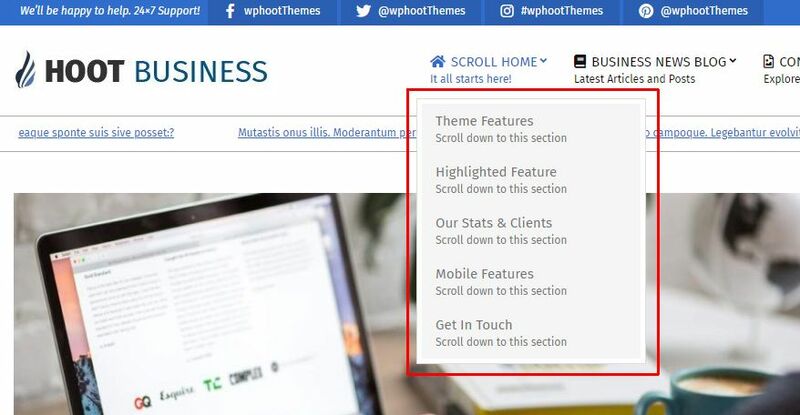 You can update your premium theme with the click of a button right from inside your wp-admin area (similar to the way you update free themes from wordpress.org). You will need to input the license key on your site to activate One Click updates. On the landing Purchase Receipt page when you make the payment. In your wp-admin area, go to Appearance > Hoot Theme Manager. You will get a notice within your wp-admin area once a new version is available. Simply click the update now link to update the theme. If you do not intend to use Hoot Business on a specific domain anymore, or if you are changing domain names, you can deactivate a license for your domain right from your wp-admin > Appearance > Hoot Theme Manager. 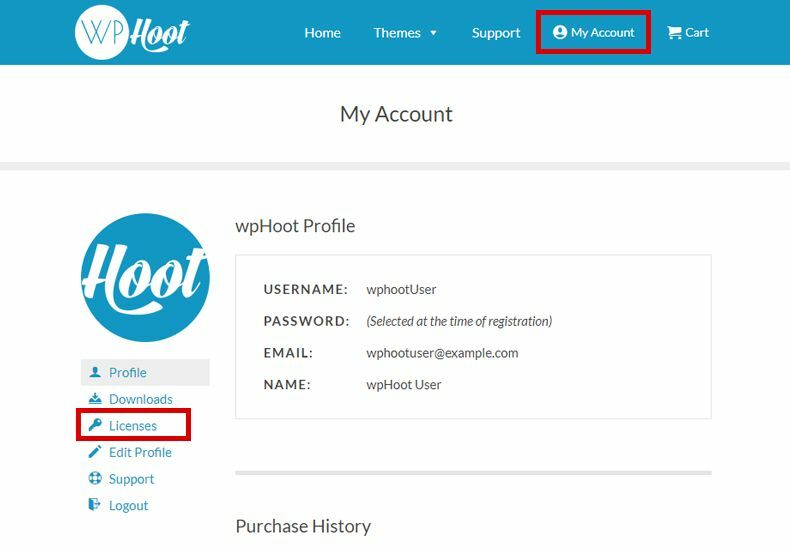 However, if you deleted/migrated your site from a domain without deactivating the license first, you can do so later at any time from your wphoot.com members area. If you are not already logged in, login to your wphoot.com account. Click on the download icon in the menu at the top to go to the Downloads page. Scroll down to your Purchase History and click View Licenses next to your purchase. On the next screen, click on Manage Sites. Here you can deactivate the license key for domains that are no longer active..
Usage of child themes is highly recommended whenever you make heavy CSS customizations, or make changes to any template files (PHP code). Child themes are mini themes which act on top of the main parent theme. The biggest advantage of using child themes is that you can make changes (css or php) in them instead of the main parent theme. This will allows you to easily update the main parent theme without losing the customizations you make in the child theme. Developers Note: Hoot Business framework automatically detects a child theme and adds its stylesheet along with the main parent's style.css using proper priority. This ensures compatibility with certain plugins and dynamic css. Hence developers do not need to enqueue parent or child theme's stylesheet again in child themes functions file. Download the sample Hoot Business child theme from above link to your computer. Even though the child theme uses the parent theme as its base, WordPress treats them separately in some respects. One of them is your Customize Settings. Note: You can have any number of child themes for a main parent theme. This is useful if, for example, you want to use a different color scheme for the holidays, but dont want to lose original settings for the rest of the year. Since WordPress stores customizer settings separately for child and parent theme, you may want to port Customizer settings when you first switch from parent to child theme (or vica versa). Fortunately our premium version comes with a simple Import/Export feature. Install and activate your child theme. Your existing content (posts, pages, categories, images etc) will NOT be deleted or modified. Demo posts, pages, images, widgets, menus and other theme settings will get imported. Install and activate the HootKit plugin if you haven't already done that. Click the Import Demo Content button. Please click on the Install button only once and wait. Import can take several minutes depending upon the size of the content. Click on Switch to Manual import link on this screen. Select the files you want to import. You can import any one (or all three) of the above files. Click the blue Import Demo Data button. Please wait for the Import function to finish. Import can take several minutes depending upon the size of the content. The above 3 files can be used independently with the WordPress Importer, Widget Importer Exporter and Customizer Import/Export plugins as well. You can make One Page websites with menu items linking to different sections on the page. The page will scroll down to a section on the page when the site visitor clicks a menu item. 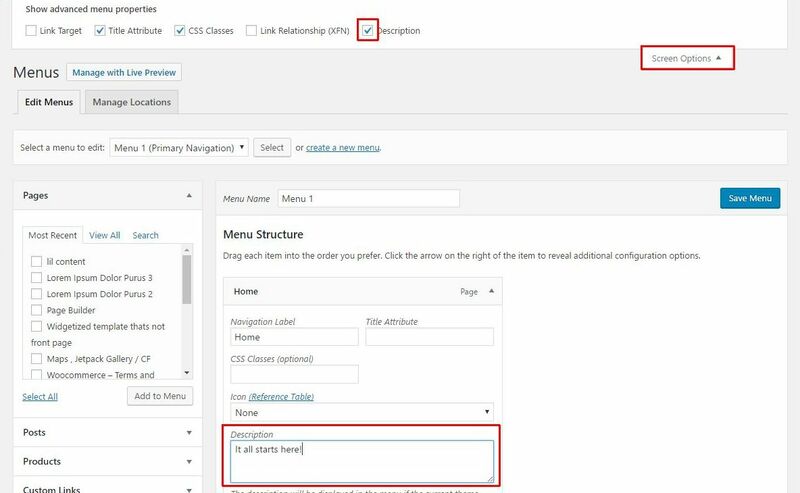 See the Home menu link on the demo site to see Scrollpoints in action. This is not just limited to menu items. You can manually add links as well to different sections on a page. For example, if you have a very large article, you can add links at the top to different article sections. When a visitor clicks on any of these links, the page will automatically scroll down to the corresponding section. Click here to know more about Scrollpoints - How to add them to menu and/or create manual links. Lightbox gets activated automatically on installing Hoot Business Premium. By default it opens all links pointing to images (.jpg .jpeg .gif and .png) in a standalone lightbox. When you create WordPress Galleries, Hoot Business's Lightbox automatically converts the links to a lightbox gallery. Just make sure your gallery images link to Media File in the dropdown. You can disable a link pointing to an image simply by adding the no-lightbox class to the link. Click the Setup & Layout section. Check the Disable Lightbox checkbox. Hoot Business Premium lets you display a custom page for the default 404 Not Found page. Click the 404 Page section. Select Custom 404 Page option. In the dropdown, select the Page you want to use as your 404 page. Once you have Saved the Settings, head over to Pages > All Pages to edit the content of this page. 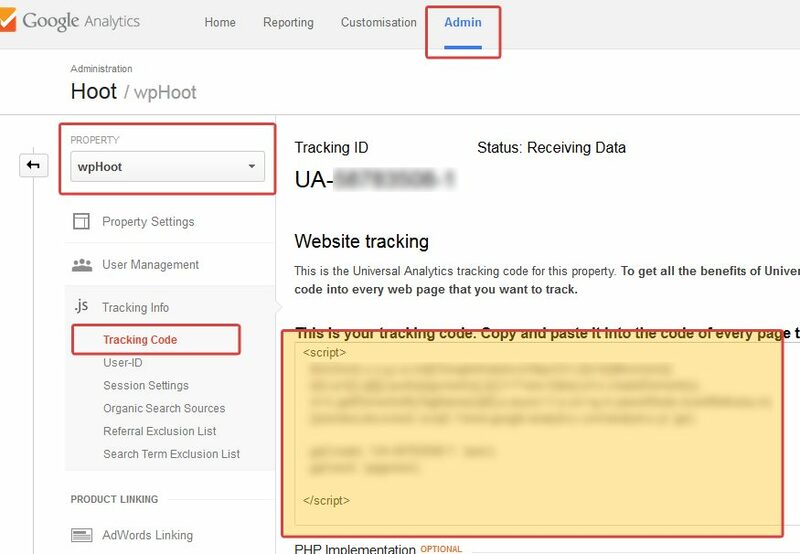 Setup your Google Analytics account and get your tracking code. Click the Custom Code section. The logo image is automatically reduced to the maximum available width which is 500 pixel (40% of the 1380px grid) when it is in left. However there is no width restriction if the Primary area is set to None in Customizer > Header i.e. when the logo is center aligned. Custom code snippets to modify your theme can be added using Child Themes. Custom CSS can also be added from your wp-admin by going to Appearance > Customizer and clicking Custom Code section (for premium theme version) or Additional Custom CSS (for free theme version). 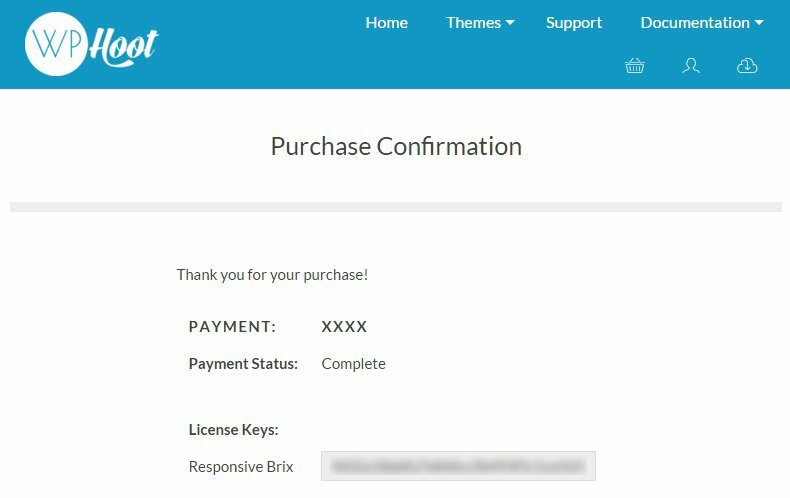 Sometimes you may not want to display the title area for some specific pages (for example, the checkout page of WooCommerce). 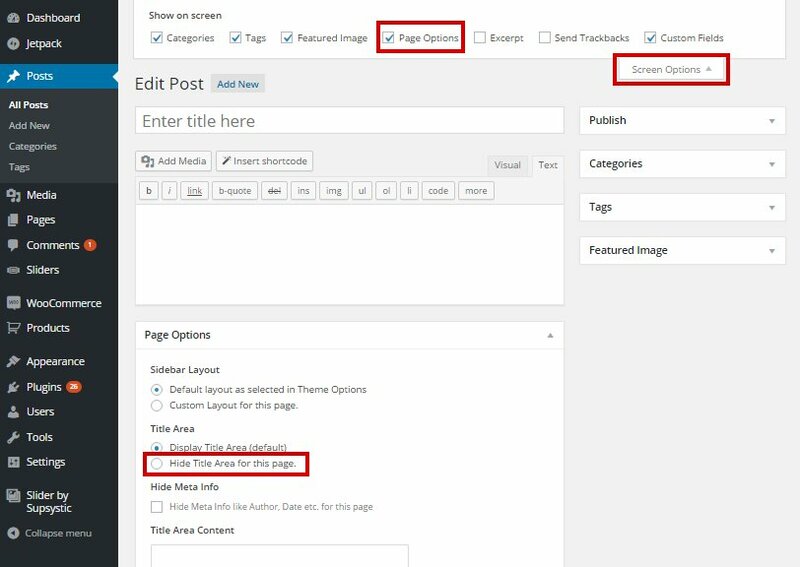 In such cases you can disable the Title Area for specific pages from your wp-admin area. Go to Pages/Posts > All and click the Page/Post you want to edit. On the Edit Page/Post screen, select the Hide Title Area for this Page option in the Page Options box. In case you do not see Page Options box, make sure it is visible from the Screen Options dragdown button at the top right of screen. Add the following CSS to remove title area throughout your site. Add the following CSS to remove title area from all Pages on your Site. Add the following CSS to remove title area from all Posts on your Site. Add the following CSS to modify the Title area height.